recipe for crazy blog: What does she eat? I've been asked a few times what my 18 month old eats so I decided to dedicate a post just on that. I hesitated to post this because I don't know what you guys feed your kids, I've seen some of the mini pieces of art you guys make out of your kid's meals and then there's the, "what will people think?" Am I giving her enough fruit, dairy, whole grains? Am I feeding her too many sandwiches or too much meat? Yes, no, either way, it is what it is, so here's a little glimpse into what she eats. I'll start with breakfast. We rarely eat the same thing two days in a row. I'm just not a planner and just make whatever sounds good, easy or what I have on hand the morning of. One thing that's pretty constant is fruit. I go to Aldi about once a week just for produce - 99¢ pineapples & strawberries - worth the drive for me! Oh, and she always has milk with breakfast. She wakes up asking for milk. Anyway, here's a random week in photos. 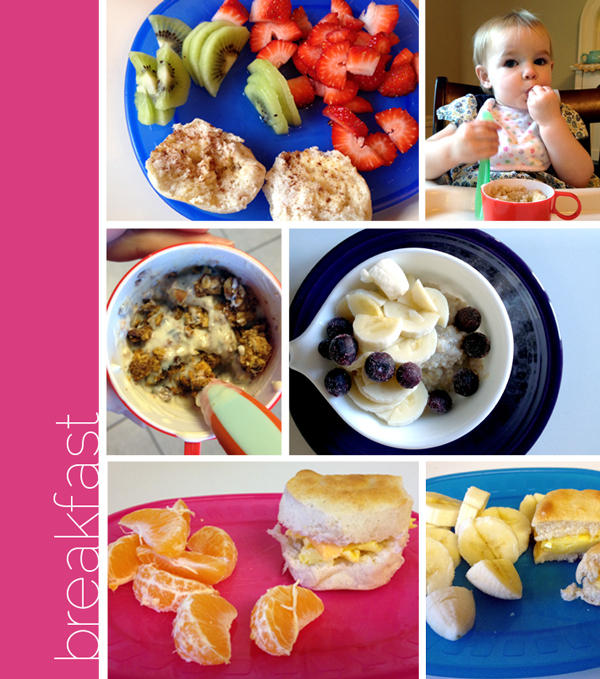 top left to bottom right: biscuit with butter and cinnamon/sugar with sliced strawberries and kiwis, steel cut oats with bananas, yogurt with granola, steel cut oats with bananas and frozen blueberries, egg and cheese biscuit with a cutie, another egg and cheese biscuit with bananas. 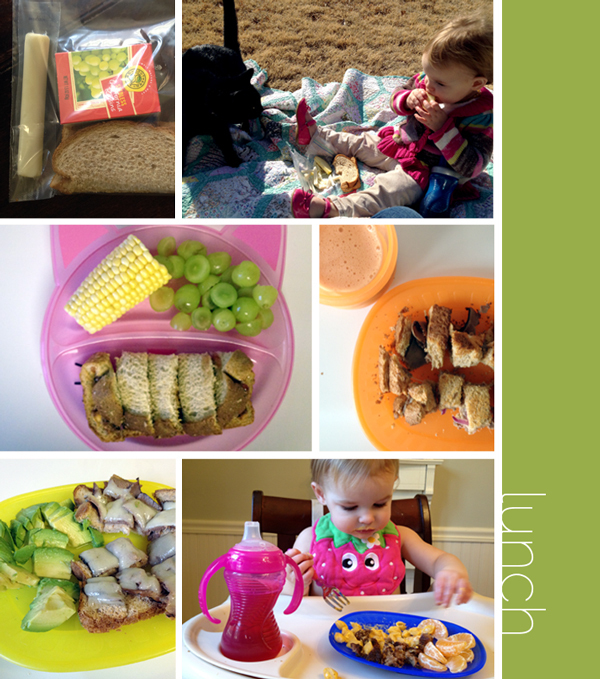 We typically eat the same thing for lunch to make it easy. If I make a sandwich, whether it's pb&j, roast beef or grilled cheese, I half it between the two of us. Then it's cheese and fruit or a veggie. --> Yes, I'm aware how boring this post is, but it has been asked! Anyway, here are some random photos. PBJ, string cheese and raisins, roast beef and cheese sandwich with raw corn and grapes, ham and cheese with orange/strawberry smoothie, roast beef and cheese with avocados, left over cheeseburger with a cutie and juice. I totally failed at dinner photos. Dinnertime is the crazy time for us. Sweet P is usually hungry and climbing up my leg or peering over the cutting board as I prepare dinner, the husband isn't home from work yet and I'm just scrambling to get food on the table. So, forgive me for forgetting to take some sample shots. Basically, she eats what we eat with a cup of milk. Mexican food - she loves dipping her chips in salsa or queso and licking it off, then she gets some of what we ordered. All that to say, the kid likes just about everything - except broccoli! She hates that. Her favorites are fruit of any kind: strawberry, kiwi, grapes, banana, pineapple, oranges, apples and pears. Her favorite veggies are corn, sweet potatoes, potatoes, carrots, peas and squash of any kind. Yes, you read it right. That is the most requested snack of any. She doesn't get them very often and when given the choice between a cracker or ice cream, she chose the cracker. Who is this child? I'm scared to see if she'd pick a cracker over a donut. Goodness knows I wouldn't! Ha! I'm sure that is WAY more info than any of you care to know about the eating habits of an 18 month old, even those that have asked! But there you have it. I think every mom worries that their child isn't eating enough of the right stuff. I know I have felt and still feel that way majority of the time. Especially when they hit that age where they're feeding themselves...it's all about learning what they like and dislike. My twin girls are definitely there. Sweet P's meals look really good and full of color, which is great! You're doing a fine job. Seems to me you feed her a wonderful array of foods. She's growing and thriving so you are obviously doing something right. As for broccoli, my daughter (now 6) doesn't care for it either. At age 4 she told me "broccoli isn't for people." No joke. My almost 2 year old loves salsa!! And loves avacodas! He will not eat much fruit :( mainly just grapes (cut into 4th because I am a freakazoid when it comes to choking) and apples (he likes them peeled and whole). He loves green beans, pinto beans, black beans. He also LOVES bacon. He could put away a whole package if I let him. Likes biscuits, eggs, oatmeal, and he loves my homemade pancakes. This is so not boring to me, I love getting inspiration for kids meals. Thanks! Love having ideas for my toddler! Thanks for sharing. My soon to be 2 year old also HATES broccoli. Nothing I do will make her eat it. she did as a baby if I pureed it but it gave her nappy rash so I stopped. Now i can't get her to even try it. She also loves fruit. She does not like sweets at all, but then I have not really given her any. I tried this week, she bit it and then handed it back. She loves more savory snacks though.